Your Free College Education Has Arrived! Maybe you're wanting to review that class that you took a few years ago. Maybe you want to prepare for a class before next semester starts. Maybe you just enjoy the process of learning. Whatever your reason, TheFreeCollege.com is here to help you on your journey. Sign up for an account, Bookmark a class, and start learning! A study of prolegomena as the nature, method, and sources of theology; revelation, especially the inspiration, authority, sufficiency, inerrancy, and canonicity of the Bible; and theological hermeneutics, including an introduction to dispensationalism. 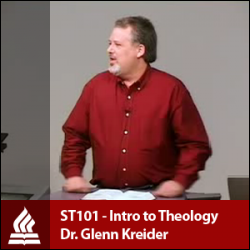 This course is prerequisite to all other Systematic Theology (ST) courses. 3 hours. This site is copyright © 2010 by TheFreeCollege.com, Corey Pennycuff, owner. All Course Content is copyright by the respective author.